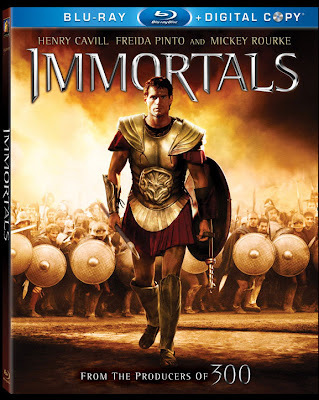 IMMORTALS DVD will be released on March 6, in a little more than 2 weeks from today. I didn't see this film in theatres which seems was released just yesterday. The dates between a movie's release in theatres and the home market are getting shorter and shorter and Hollywood wonders why folks are not going to movies anymore. And because most theatres are digital projections, like the same on your flatscreen tvs at home, the novelty of going to the movies is quickly dwindling. My 2 cents. Yeah, but the gods were shown as way too weak, as basically human folks up in the clouds who lived a long time and who obviously worked out four times a day. That was a cool scene where one of the gods helped Theseus fight the bad guys, and by so doing saved Zeus's 20-year plan when Zeus wouldn't do it himself, and also by doing so was smashed into stone so hard that he penetrated it for a mile or so. Zeus was an idiot. At the end, we see Zeus pulling with all of his strength, literally, on the cords to destroy the mountain; another foot-pound would have caused him to fail. This, the dude who created the world and mankind? What an impostor.